Maki House Moms is a community social group for parents and babies. The group will meet each Tuesday morning from 10 a.m. to 11:30 a.m. at Maki House (19 Leeming Dr). The journey of motherhood, while an incredible experience, can often be a very challenging one. Connecting with other mothers in the community who are experiencing similar situations and life changes can make the journey all that more enjoyable. Join others going through this journey each week for hot coffee, fresh baked goods, adorable babies and discussions around the joys, turmoils and everyday realities of motherhood. 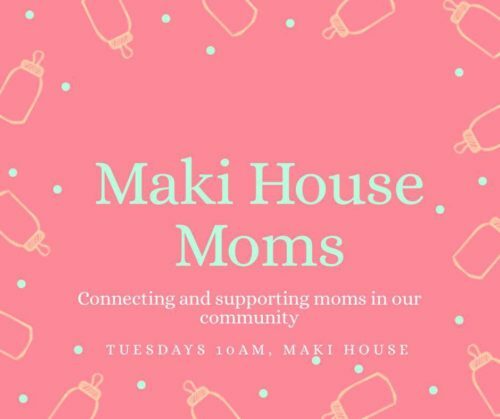 Maki House Moms is an inclusive, supportive and safe space for all mothers in the Crystal Beach Lakeview community, as well as our surrounding neighbourhoods in West Ottawa including Crystal Bay, Rocky Point, Qualicum, Britannia and Bell’s Corners. While this group is geared towards connecting and supporting parents with babies/toddlers, mothers and children of any age are always welcome, as are mothers-to-be. Please feel free to drop in any week. No need to register and there is no charge, though small donations are appreciated. For more information, join the Maki House Moms Facebook group, or contact group coordinator Samantha Graziano, at samantha_graziano@hotmail.com.